Ryan Gosling has been added to another list ... Dishmag have collated a list of actors with bands and to quote Dishmag "there are a few actors who have deservedly gained street-cred for their musical abilities." 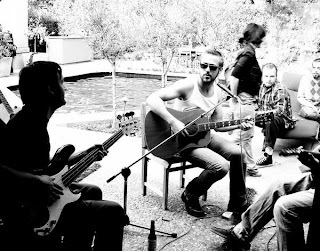 Ryan Gosling formed Dead Man's Bones with his friend Zach Shields in 2008. Gosling and Shields have an obsession with scary subject matter and write songs stories about ghosts and monsters. 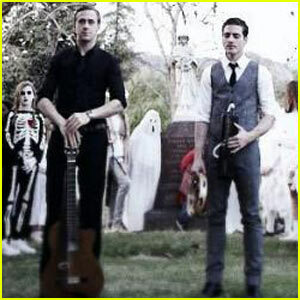 To see some of their songs have a look at our Halloween music post here. "As if women everywhere didn’t already worship him enough, Ryan Gosling adds dreamy crooner to his résumé." "To make matters even cuter, Gosling performs under the alias “Baby Goose”." "Yes, Ryan Gosling taught himself to play the piano and cello, supplying more proof that he is, in fact, perfect." So there you have it direct from Dishmag ... Ryan Gosling is perfect!